Small discs of gold gleam on a beach at twilight. It’s not pirate treasure–it’s a little, tiny, petal-less flower. 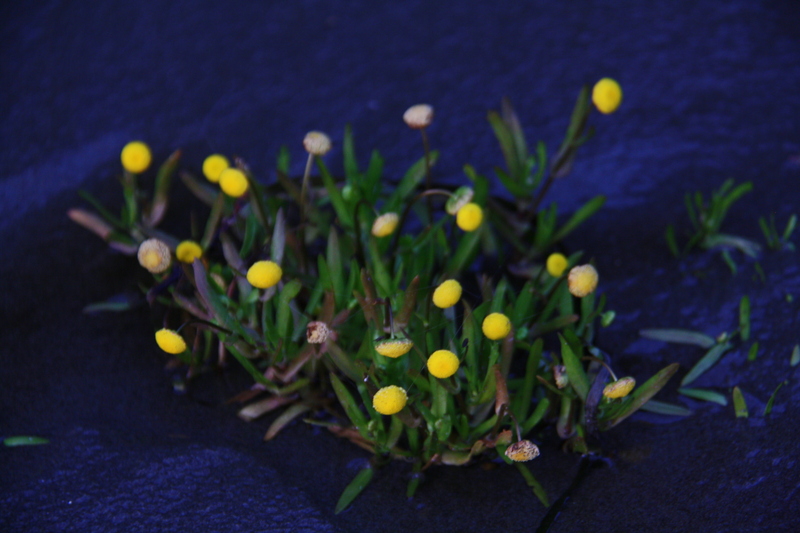 Brass buttons (Cotula coronopifolia) can grow in both salt and fresh water marshes. I saw it growing in the sandy flats where a stream spread out flat across the beach before flowing into the ocean. Its small seeds are spread by birds or moving water, but it also can reproduce vegetatively, sprouting roots at the joints of its stems. Brass buttons is a member of the Asteraceae family but it has only disc flowers–ie none of the typical daisy-like “petals”. Instead it looks like a little yellow pincushion. This is a non-native plant that was introduced from South Africa to California, but since it spreads slowly it isn’t known as a big ecological problem.